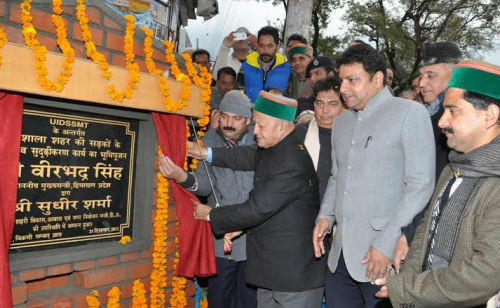 Dharamshala: Chief Minister Virbhadra Singh performed the Bhumi Pujan of ‘Project Construction and Upgradation of various roads in the Dharamshala Towm’ under Urban Infrastructure Development Schemes for Small and Medium Town (UIDSSMT) under JNNURM at Dharamshala today. 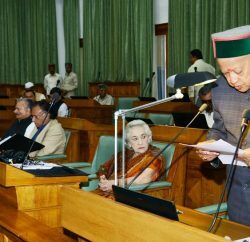 Speaking on the occasion, Virbhadra Singh said that 48 roads measuring 29.758 kms would be upgraded to cement concrete roads in the Dharamshala town by spending Rs. 2094.50 lakh. The Dharamshala town has been bifurcated into three parts under the project which include 11 roads having length of 10.267 kms in Meclodganj area, 24 roads of 8.724 kms length in Dharamshala and 13 roads of 10.767 kms length in Ramnagar and Shyamnagar area. He said that the DPR of the Project was sent to Government of India by the State Urban Development Department on 27 May, 2013, for which administrative approval was granted by GoI on 22 October, 2013. 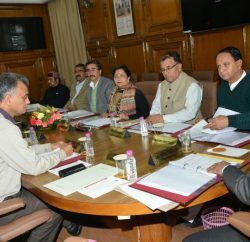 He said that the State Government was endeavouring to provide various facilities for Dharamshala which was the second biggest town of the State and efforts were afoot in this direction. Food & Civil Supplies and Transport Minister G.S. Bali, Forest Minister Thakur Singh Bharmouri, Urban Development Minister Sudhir Sharma, MLAs Sanjay Rattan, Pawan Kajal and Yadvinder Goma, Chander Kumar, Vice Chairman KCCB Kuldeep Singh Pathania, Vice Chairman H.P. Forest Corporation K.S. 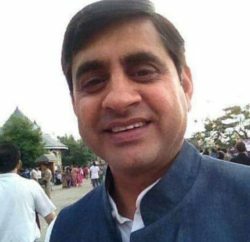 Pathania, Commissioner C.Paulrasu, S.P. Balbir Thakur, officers and employees of KCCB and prominent persons of the area and senior officers were present on the occasion.